If you’re new to Interactive Whiteboards, chances are you’ve had a couple of training sessions that focused on creating pages from scratch. While I am definitely a big advocate of being innovative, I also strongly believe that time is precious and teachers have too little of it. In this post, I’ll give you some tips on how to seamlessly incorporate your pre-existing lesson activities for use on your new IWB. This function allows you to write on top of whatever is on your computer screen, whether it be a powerpoint presentation or a webpage. Being able to annotate on your desktop is super handy if you have notes, activities, and lesson plans saved on word processing documents. When I first got my IWB, I had lots of outlines of notes that I would fill in on an overhead projector with my students. By using desktop annotation, I could continue this practice as I got accustomed to my board. This tool is also useful for editing student work, highlighting important ideas on websites, and more. 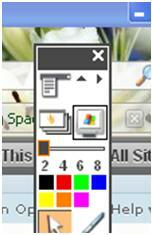 On your toolbar, select the icon that shows a screen with the red, green, blue, and yellow squares that look suspiciously similar to the Microsoft windows/butterfly. If it is not there, it may not be activated. Click your Main Menu, scroll over “Customize” and make sure “Allow Desktop Annotation” is checked. You’ll notice that your sidebar and your tool bar stay on the screen while everything else disappears. Treat your desktop annotation just like you would any other page. To manipulate objects with your mouse, select the cursor icon (looks like an arrow). To cancel the desktop annotation, click “Cancel” at the bottom of the screen. On your toolbar, look for a black box that has a white and gray checkered design inside it. If you can’t locate it, go to “View” and select “Transparent Background.” When selected, the Notebook page will disappear and be replaced by a mini toolbar. You can write on the desktop using the pen function or by picking up a pen from your tray. Click the “. . .” on your toolbar for tools that aren’t displayed, such as the screen shade. To erase all annotations, click the icon that looks like an eraser. To keep your annotations and start a fresh page of notes, click the icon with the green “plus” sign against a paper. To keep your annotations but get your mouse back, click the cursor icon (it looks like an arrow). To go back to your notebook, click the transparent icon again or the red “X” box. Screenshade hides everything on your screen. You can then pull the screen up, down, to the left, or to the right to reveal only part of the screen at a time. This tool is useful if you do not want students working ahead when taking notes or if you want to cover up answers one side of a page. This tool can also help to underline text. You can use screenshade both inside your software’s programming or while annotating on your desktop. This icon is called the “Reveal Tool” and looks like a window shade almost completely rolled up. If it is not in your toolbox, go to “Main Menu”, “Customize”, and click “Toolstore.” Find the tool under “Presentation Tools” and add it to your toolbox. Activstudio only lets you move one side of the screen shade at a time. If you’re looking for more flexibility, try the “spotlight” tool. You can adjust the size of the spotlight – really useful for showing students their grades privately. This icon looks like a window shade being pulled down. If you can’t find it on your toolbar, go to “View” and select “ScreenShade.” To get to this tool while annotating on your desktop, click the “. . .” on your toolbar and choose it from the options. To move the screen, grab the darkened circles on the sides. You can move up to 2 sides of the screen at a time. If you know how to activate the spotlight on Smart Notebook, please let me know! This entry was posted in First Steps, Interactive Whiteboards, Practical Tips.